Abu Aqeel (may Allah be pleased with him), a man from the Ansaar [Helpers of the Prophet in Medinah], was one of the first people to be injured on the Day of Yamaamah. He became hurt as a result of an arrow that struck him somewhere between his shoulder and his heart; it was a serious but non-lethal blow, and he was able to pull out the arrow. Nonetheless, his entire left side became weak, and so he returned to the Muslim encampment in order to seek medical attention. When the fighting became intense and the Muslims were forced to head back towards their encampment, Ma‛an Ibn ‛Adee (may Allah be pleased with him) called out, "O people of the Ansaar. (Remember) Allah! Allah! And turn around and bear down upon your enemies." So as to set an example for others, Ma‛an then raced ahead of everyone else, plunging directly into the ranks of the opposing army. And the people of the Ansaar, in response to Ma‛an's plea, were right behind him. At that point, Abu Aqeel (may Allah be pleased with him) got up, intending to catch up to his Ansaaree brothers. Some Muslims tried to convince him to stay where he was, saying to him, "O Abu Aqeel, you are not for fighting." Abu Aqeel (may Allah be pleased with him), referring to Ma'an's plea for help, said, "The caller mentioned me by name." Someone responded, "The caller merely said, "O people of the Ansaar." He was not referring to injured fighters." Abu Aqeel (may Allah be pleased with him) replied, "And I am from the Ansaar, and I will answer his call to his arms, even if I have to crawl (towards the enemy)." 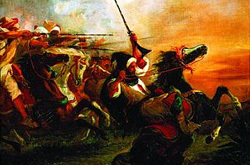 Because his entire left side was weak and numb, Abu Aqeel (may Allah be pleased with him) was able to hold his sword with his right only; nonetheless, with pure grit and determination, he marched onwards toward the enemy, all the while calling out, "O people of the Ansaar, let us launch a renewed attach like we did on the Day of Hunain." Every member of that elite Ansaaree group then fought with high spirits, seeking out one of the two things: Martydom or victory. With their renewed attack, they forced their enemies to retreat and seek refuge in the "Garden of Death". During the course of this assault, Abu Aqeel's arm was cut off; in fact, he was inflicted with a total of fourteen wounds, each of which was lethal in and of itself. Later on, when ‛Abdullah Ibn ‛Umar walked by him, Abu Aqeel (may Allah be pleased with them both) was taking in his last few breaths. Ibn ‛Umar said, "O Abu Aqeel," to which Abu Aqeel (may Allah be pleased with him) responded with a heavy voice ""Here I am, answering your call. Who has won (today)?" Ibn ‛Umar (may Allah be pleased with him) replied, "Rejoice, for the enemy of Allah (i.e. Musailamah the Liar) has been killed." Abu Aqeel (may Allah be pleased with him) then raised his finger towards the sky, a gesture by which he meant to praise and thank Allah. ‛Umar Ibn Al-Khattab (may Allah be pleased with him) later said about Abu Aqeel (may Allah be pleased with him), "May Allah have mercy on him. He has sought out martyrdom for a long time, and he has now achieved it. Verily, he is among the best of our Prophet's (may the peace and blessings of Allah be upon him) companions (may Allah be pleased with them all)"
This story teaches us the zeal that the companions of the Prophet (May the Peace and Blessings of Allah be upon him) had when fighting for the sake of Islam and their sacrifice when it came to making the religion the highest.